Along with so many of you, I have been watching and listening to hours of coverage about the bombs that were set off at the Boston Marathon. The terror that ensued, the deaths and injuries, the heroic acts of kindness – all of it in my head and leading to so many questions. I would venture a guess that all of us have been in a situation where large numbers of people have gathered with no way to secure our safety. Furthermore, many of us have been specifically at marathons, either on the course or at the finish fine. More thoughts, more questions, more fear……….. But today I wanted to write about an interview I saw on TV with the staff of the Forum Restaurant, the site of the second bomb that was set off in Boston. With sidewalk seating, many patrons were outside, craning their necks to see what the noise was created by the first bomb when the second one went off right where they were. People ran into the restaurant, through the back and out of harm’s way. But the staff ran to the front and started helping people. When the newscaster asked if they saw themselves as “heroes,” all of them shook their heads no…….but I believe it was the Manager who said “we were in the wrong place at the wrong time but we did the right thing.” Those words have stayed with me; I found them very moving and powerful. I have asked myself many times since hearing those words – would I have done the same thing? The “right thing?” It is one thing to help someone in need when no other threat is present. I am sure I could do that. An act of kindness, a lending hand – sure. But now two bombs had gone off; might there not be more? Yet these people, and so many more, helped those that were injured, seeing unthinkable sights, and they saved people’s lives. They all put their own lives in danger to save others. These actions shout out the word HERO loud and clear. I only hope I would do the same if faced with the same circumstances. Would you??? After celebrating my birthday for the whole weekend, it was time to settle down and start eating right again! But, boy, was it fun! Thanks for all the great wishes! On the news this morning, I heard today was the Boston Marathon. While most of us were happy about the above-normal temperatures, I know the runners and organizers would be very concerned about the heat. After training so hard and so long, I can imagine how disappointed the 4,300 runners who did not participate felt about NOT going to the starting line. I think back one year ago to my marathon training and know I would have been so disappointed, too. So that got me thinking about the upcoming New Jersey Marathon that Team Push to Walk will be doing on May 6. In spite of the difficulties I faced last year in training and finishing the race, I do miss not training this year. For me, it was as much about the journey of getting ready and being prepared as the race itself. Having that goal just kept me so focused and disciplined. In light of that, I really hope that Mother Nature is kind to all the NJ Marathon participants this year and all the runners and hand cyclists can compete as they have been training to do. I was very proud of my son, Darren, who completed 14.5 miles on Saturday as part of his training. Last year, he completed the half marathon; this year he’s going for the full 26.2 miles. Go Darren! 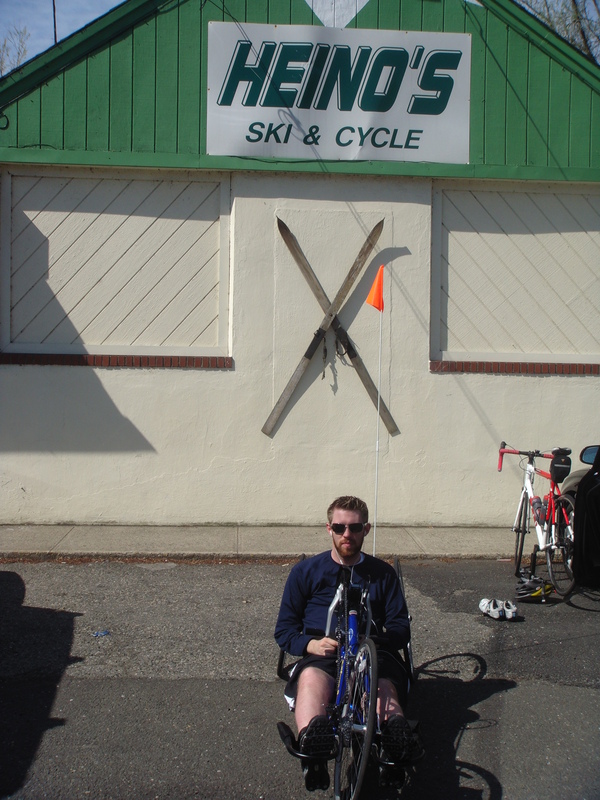 Here’s his picture at Heino’s, our favorite ski & cycle shop in Pequannock, NJ. I will be part of the support group this year, and am proud to have that role. We have clients, family members and friends on Team Push to Walk again this year, and they are raising incredible amounts of money! These funds will help clients offset their program fees for workouts, and will allow us to continue to provide cutting-edge exercise to people with spinal cord injuries and paralysis. If you’d like to support our Team in general or a specific team member, you can do so by clicking here: https://sna.etapestry.com/fundraiser/PushtoWalk/NJMarathon2012/. Or donations can be mailed to us at 6 North Corporate Drive, Riverdale, NJ 07457. Come and cheer us on! Hope to see you on May 6 in Long Branch!